Click on "Selections from "Choice Words" (below) to read a couple of pages from Johnston's book. I’ve learned the importance of communicating clearly with students through the Responsive Classroom training I’ve had and books I’ve read about teacher-talk. One book that resonated with me several years ago was Choice Words: How Our Language Affects Children’s Learning by Peter H. Johnston. In his book, Johnston made me think deeply about the words I utter and the impact they have on children. As a result of reading his book, I eradicated some common teacher-talk phrases, like “I’m proud of you” and “I like that” from my vocabulary and started using language that would increase my students’ agency and resiliency. The above-mentioned phrases can be inserted into the conversations you have with students publicly and one-on-one (i.e., during share sessions and during conferring). If you want the rationale behind using each of these phrases, then click on the link that says “Selections from Choice Words” (below) to read excerpts from Choice Words that explains the importance behind each of these phrases in-depth. If you’re thinking about infusing one or more of these phrases into your teaching, I suggest introducing one phrase per week since changing the way you speak is hard work. I spent much of the 2006-07 school year trying to change the way I talked to students and I found the best way to do it was by introducing a new phrase every week. Anytime I tried to introduce more than that to my repertoire in a given week, I found myself getting bogged down in speech and not paying attention to other things. Recently, I asked Peter H. Johnston a few questions about the language we use when we teach. Here are his responses to my questions. SAS: What are six phrases that you think are most important for teachers (of writing) to phase into their repertoire during the first six weeks of school? PHJ: I don’t think it’s so much specific phrases, although there are some. For example, we want to turn children’s attention to the process, so we say things like, “How did (or could) you figure that out?” We want them to take up noticing as a normal thing to do, so we ask, “What are you noticing?” and say, “I notice that…” We want to have them cross-check, so we regularly ask, “How could you check?” We also want to encourage the engagement of multiple perspectives, so we say things like, “Are there any other ways to think about that? We also want to turn their attention to change and possibility, so we make sure that we point out where they are changing and when they can’t do something that they understand that we expect that this inability is a temporary state – they can’t do it yet. SAS: It seems easier to develop students’ agency as writers when they’ve been in a writing workshop in the past. Do you have any tips for teachers, with regard to building students’ agency, when their students are engaged in a writing workshop for the first time? PHJ: Agency is developed by showing children that by acting, they can produce a desired effect. So, in writing, it’s about showing them, even in their spoken language how the choice of a particular word, or topic, or detail, had an impact on you or their peers. PHJ: Instead of “Good boy” or “Good girl,” which have the effect of undermining children’s resilience, turn their attention to the process they used – “Look how you figured that out.” Reduce judgment and turn attention to process. SAS: What are some identity statements teachers can use to help reluctant writers during the first weeks of school? What about kids who refuse to write… how can teachers help those students build an identity as a writer by talking to them? PHJ: I suppose the first order of business would be to actively listen to what children have say and to remove judgment from your language, particularly judgment that suggests that performance reveals something about permanent qualities of the writer. Another first order of business would be to make sure that interactions engaged the meaning and intentions of the writer. I suppose the short answer would also include starting with oral stories, and other forms of representation (such as illustrations). Beyond that, in order to avoid misinterpretation, my inclination would be to direct people to the writing of authors like Katie Wood Ray (depending on the age level). SAS: What are you working on now (e.g., books, journal articles, courses)? PHJ: What am I working on at the minute? I’ve just completed a book for Stenhouse, essentially a sequel to Choice Words, called Opening Minds: Using language to change lives. I’m currently working on a research project with Gay Ivey looking at the effects of middle school English teachers focusing their attention on engagement before anything else – particularly engagement through individual choice reading of edgy young adult fiction. The effects turn out to be very powerful not only on the volume of reading (an average of over 40 books per year) and state tests (at least 15% more pass the state test), but on the students’ personal, moral and social development. I also have a video project under way with Maria Nichols, Susie Althof and Jeralyn Johnson that explores productive classroom practices. Thank you to Stenhouse Publishers for agreeing to giveaway of one copy Choice Words: How Our Language Affects Children’s Learning. To win a copy of the book please leave a comment about this post, in the comments section of this post, by Sunday, October 2nd at 11:59 p.m. EST. A random drawing will take place on Tuesday, October 4th and the winner’s name will be announced in a blog post later that day. Please be sure to leave a valid e-mail address when you post your comment so I can contact you to obtain your mailing address and have my contact at Stenhouse ship the book to you. Please note: Your e-mail address will not be published online. Thank you so much for this post. We are currently working with our students on words in conversations and how to build a mindset that they might not be there they, but we value their thinking. This is a great piece to use in the classroom and I look forward to the new book coming out. I am currently in school to get my teaching license for k-6 and work in a school that uses Responsive Classroom – I am very interested in all this as I continue through my own program- thank you for valuable things to think about. The conversations that we have with writers, mathematicians, readers, ….is so important. I get so frustrated at times with the professional development that is offered to me from my district because it seems to be just at the surface level at times. Great information – thank you for sharing! Would love to read this book! I have memories watching my own son play Lego for hours, discovering for himself how everything fits together, I stayed close by on the carpet, watching. When I decided to teach, it was firstly in Montessori classrooms where respect of the child is paramount. I was able to continue my role as observer in these environments, merely there as a guide, never in control. Children learn much from our body posture, our smiles, our nods. Words in this environment come last. Today, in my fifth grade classroom, I continue my philosophy as facilitator, leaving discovery, problem solving and a great deal of classroom management to my students, encouraging the kind word, showing respect through listening and patience. Words are indeed, CHOICE! 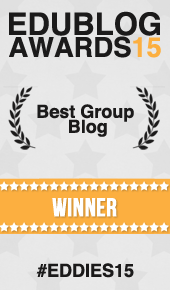 Wow – this was an eye opener- I do use praise like I’m proud of you! I will have to rethink some of the way I conference and generally talk to students. Thank you for making me aware of this! For those of you who are wondering, Peter’s new book will be out in January 2012. It is so important to carefully choose words with young writers. I love the “where are you going with…” because it is not condescending to the writer, but it forces THEM to think about the direction and focus of their piece. It is so wonderful to see students take ownership of their writing! Somewhere along the line, we (teachers) ignored our instincts and began to believe that complimenting EVERYthing, making children always feel GOOD was a good thing. How wrong we were. This book brings us back to our beginnings, where we want to use language that will release responsibility for learning (curriculum or behavior) to children. If they want to be responsible, they need to be able to reflect and think critically, not always believe that everything is perfect. These snippets of language are hard to implement if you’re not used to them, but boy do they release responsibility. And, in turn, they open our eyes to our own next step in teaching our children…about writing, social responsibility, anything. I also had this book on my list awhile ago–I wish I could purchase everything Stenhouse publishes! I love the few suggestions in your post so I’m sure the book has plenty more that I could put to use! What power our words have whenever they leave our mouths and our pens! Our responsibility is great to be accountable for doing the hard work necessary to make life-giving choices. I am looking forward to reading Choice Words. I have heard so many wonderful things about this book. It’s been on my wish list for years but always seems to get passed over. Sounds like it needs to move back up the stack. Words are a powerful tool when used correctly. Thank you for the giveaway opportunity. I absolutely love this book. I think that I’ve read it at least five times. I’m thrilled to learn that there’s a new one coming out! Can’t wait. Thanks for the illuminating interview Stacey. What a timely post! I read and loved this book a few years ago. It is great to be reminded of its wisdom. This weekend I have been working on a note to parents of my six-year-old students. Based on this post and Choice Words I am reworking some of the suggestions about how to support their children’s reading efforts. hi and great post about how our words matter!! Always looking for new words… they create the weather in our rooms..
Beth Rogers mentioned Betty Garner’s book, Getting to Got It, and I immediately connected with her thoughts. Both of these books are all about changing the intention behind what we do by changing the way it comes across to our students. This also made me think about how after seeing Nancie Atwell speak for the 7th or 8th time, I realized what I learned from her that made the biggest impact in my classroom was the language she uses in reading and writing workshop. It was such an Aha moment for me. Language is not a small piece of what we do. It is the front line of our every interaction with students. I am most interested in the work Johnston is doing with Gay Ivey because there is such a need for hard data when it comes to best practices in middle school. I am so thankful for the question you asked that prompted that information! “I bet you’re proud of yourself” is one phrase I often use. I had forgotten where I learned that since I’ve been using it for a while now. I read most of “Choice Words” online at Stenhouse. I would love to have a copy. I’m an unemployed teacher, so winning a copy would be awesome!!! Great insight on how we influence children. I will strive to change my language. We used RHJ’s book several years ago as a book study-and gained so much, but it is helpful to have Stacy’s post as I tend to become lax on my choice words and fall back into old words. I especially like the application to Writing Workshop choice words. The blog post with all its comments is already a valuable read. Can’t wait to read the book. I find these techniques — praising specific actions and asking students, What will you do or what will be your next move? work well on the playground and in other social situations — reducing the “Teacher, she pushed me” tales I hear. 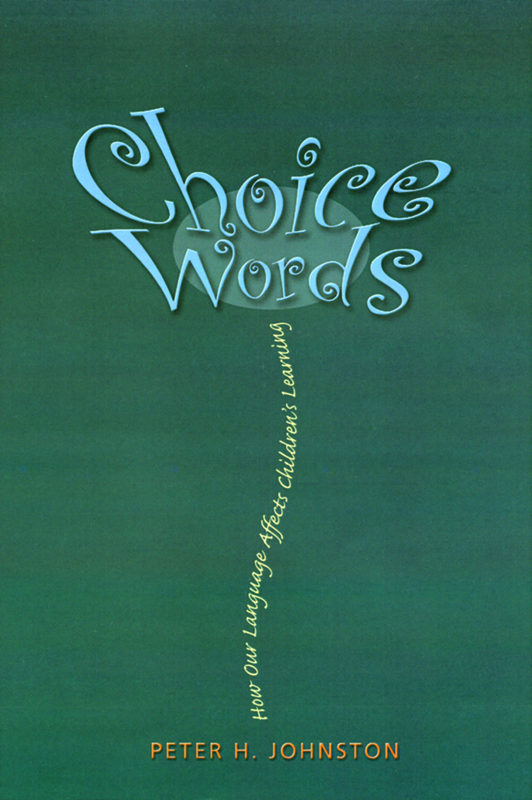 The Choice Words book looks like it could make a big difference in the students learning. Communication is key to our students. Changing how and what we say to our students can make a positive impact on learning. Teachers are often the only mentors that some children have. It is critical that their time in school makes a positive impact on their learning, as well as other areas of their life. I am working toward getting my master’s degree in literacy. My professor was talking about this book in class last week. I’d love to read it! Isn’t it interesting that changing our language is one of the hardest techniques for teachers to master. It’s hard. This book looks like a valuable resource. Choice Words is a powerful book. After studying the book with colleagues a few years ago, we created a conference card with Peter Johnston’s words. The front had questions we thought made sense for reading conferences and the back had questions that seemed to match writing conferences. We used them like cue cards as we conferred with students. This is a wonderful reminder that I need to get that card out again. Also, I am looking forward to reading his new book! Interesting. Sounds like a great reaource to help with my ongoing goal of improving my teacher language. It’s a grand thing, to use words with the power to change behavior. I’ve found that this book has been such an influence in how I react to student work and behavior. I wanted to add that since I taught so many years with middle school students whose work I evaluated at home much of the time, I would use the same words as written comments. Even writing the questions like ‘what are you planning here?’ and ‘where is this going’ enables students to think about my question when they receive the writing, & conference with me later about the answer, or the plans, etc. I’m looking forward to that next book! The language we use is so important in shaping minds. The language suggestions for reducing judgment and increasing agency by turning kids’ attention to process reminds me of Carol Dweck’s work with fixed vs. growth mindset. Choice Words is a book that I would like for all my teacher’s to read. I am always trying to work on the choice of words that I use with my students. Whether it is regarding Writer’s Workshop or a behavioral issue, the words I choose to use could potentially have a lasting affect on my students. As a writing teacher, articulating what I want the students to comprehend can be a real challenge, so having some guidance from Choice Words is very helpful. I especially appreciate the explanations for why some comments are more or less effective than others. Thanks so much for helping shape my words as a new teacher. I’ve noticed that some of the phrases were the same that I learned from “Teaching with Love and Logic”, so luckily I am already incorporating some of those and would love to add more! I will definitely have to check out this book. Thank you. There is a lot to think about, and I’m always looking for ways to better myself. I love that there are some examples listed, and will try to add one of those in my repertoire next week! I used Choice Words as the base for one of the most profound book groups we’ve ever had in my school. Teachers still have quotes posted and check in with each other to help develop their use of language. When is the new book due out? I can’t wait! I love the idea of learning how to better speak to children about their writing. We have been intentional about the way we speak to children for years through programs like Love & Logic, Conscious Discipline, and more recently Betty Garner’s work with Getting to Got It using language like, “What do you see, what do you notice?” I’m excited about learning to talk to children as writers in ways that will build their thinking about themselves and the process. Can’t wait to being this back to our writing team! The phrases will be valuable in all subjects. Looking forward to finding out more from the book. Thanks for the blog notes on the book. I am always looking for the next professional book to add to my library. I truly cannot wait to read this one. Love the phrases to replace and include. Printing and placing two of my favorite on the front of my plan book to remind me daily to use. I always wondered about this. The was always under the impression words we choose and the way we phrase them has a big impact on student perception and achievement, but never really thought hard about what the correct thing to say was. I am a substitute teacher, and am finding how important phrasing is for obtaining and keeping student attention. Thanks for the post and the book recommendation, it is definitely being added to my reading list! I’m always trying to find better ways to question and just plain talk to my students. Teaching Kindergarten makes it even harder because they’re so young. I had a colleague who had the phrase, “What will you do?” down to a fine art. She could say this phrase with sincerity to fit any situation. If a student is upset she says, “Oh, what WILL you DO?”, if they are angry she says, “Oh my gosh, WHAT will you DO?”, if they being accusatory she says, “What will YOU do?” Of course it only works if the listener is really interested in listening, which she is. She has just found that by using this phrase she keeps from launching into too much “help”. When she first shared this with me I immediately thought of Peter Johnston’s book, “Choice Words”. Great information for the teacher! I’m always groping for the right words to make a difference in a student’s writing. Besides the new phrases, the thought behind the phrases will help me come up with some good phrases of my own. I am intrigued by this book as the ‘good girl’ / ‘good boy’ is one that gets under my skin. If they hadn’t done the thing you are meaning to praise would they be ‘bad’? I will now leave my soap box and say that I am happy to know there are kindred spirits out there. Changing one’s language is hard work! In the beginning it feels forced but the shift in thinking that occurs, for both students and teacher, is powerful. Rather than being the bearer of judgment, good and bad, the teacher then guides students to think about their work on their own terms and throws the assessment back at them: what do you think of your writing? Your picture has lots of details. How did you decide what to add to your illustration? Tell me the story of your picture? are some ways I’m trying to suspend judgment for my young writers. Johnston’s suggestion that we always talk about process is an important one. The focus becomes the work rather than the child who may be accustomed to thinking that he is (or is not) a good (bad) writer/illustrator/thinker, etc. Carol Dweck’s idea of mindset plays heavily into this discussion, I think. Thanks for posting this interview and offering the give away!